There are two ways to add value as a multi-asset class mutual fund, the traditional alpha of picking investments and beta timing through asset class allocation changes. A beta timing choice, for example, is picking whether to hold stocks over bonds. An alpha choice is picking the right stocks. The quality of a manager is based on his skill characteristics. Some can be classified with the first type, beta choices, as showing characteristic timing while alpha generation will show-up as characteristic selectivity. Timing skills are hard to measure. In a perfect world, having position information is important, but not always available. There is the strategic choice of assets and also the tactical changes in these allocations. The timing skill is the ability to re-weight asset classes against the strategic allocation. Some argue that measures of trading skill are based downward if changes are made between measurement observations. If you trade tactically inside of a month and skill is measured monthly, the value of timing may be lower than reality. Similarly, other will say skill is biased upward because long-term strategies like the use of options can add value but is not truly related to timing skill. There is much room for discussion in this area, but the latest work suggests that timing skill does not exist for most multi-asset class mutual funds. 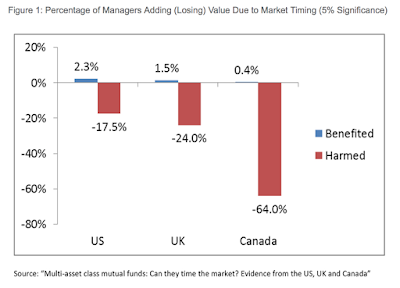 The paper "Multi-asset class mutual funds: Can they time the market? Evidence from the US, UK and Canada" looks at timing skills through a number of approaches to measurement and finds that skill is rare. It may exist, but not with most and not with mutual funds. It does not matter what part of the world. Timing of asset allocations is hard. Every discretionary trader faces a challenge when he trades with any conviction. The interesting question is what happens when the trader is presented with new facts. The whole idea of trading with conviction is showing confidence in an idea that will allow you to risk sizable money. A correct conviction is what generates above average returns. However, conviction can go overboard if you are not willing to hear about new facts or alternative arguments. The best traders are ones that can change their minds when presented with new fact. Unfortunately, psychologies have found something called the backfire effect. The premise most work under is that when beliefs are challenged with facts, your opinions will be altered. In reality, when deep convictions are challenged by contradictory evidence, our beliefs actually get stronger. Most protect what is in their collection of beliefs. Over time, you become less skeptical of your beliefs. 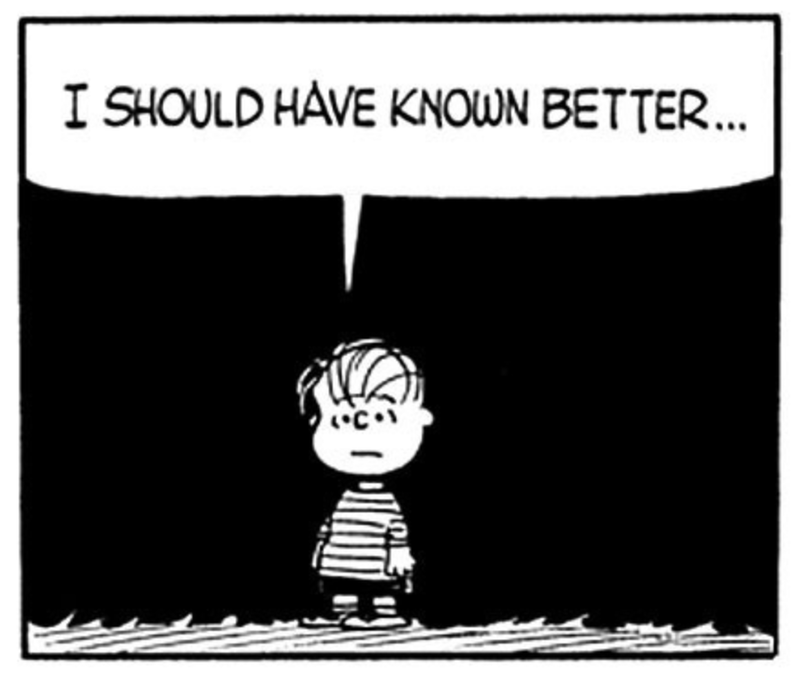 Perhaps Yogi Berra said it right, "Don't confuse me with the facts." We know this effect to be true from our experience. Many don't want advice supported with facts. Researchers have found that this bias may be stronger the more knowledgeable someone is about a subject. Experts are less sensitive with changing your views. Trying to correct someone with evidence does not work. If you give both side of an argument, the opposing facts, even when true, are dismissed. This tells us much lot about human nature and also why there is failure with investing. Investors will hang onto their losers because alternative facts may only cause intransigence. You will hang onto those ideas until the pain of lose overwhelms. So what can you do to avoid this problem? Obviously, a stop loss will help. There is a point where you will cut your loses regardless of your views. You impose stopping behavior upon yourself. Of course, you have to execute when the stop is reached and not change your mind. The broader issue is learning to follow a disciplined approach open to new facts. One of the great advantages with systematic trading is that as new information is received and updated, it will not be dismissed or discounted. It will be used in the exact way it was programmed. There is no backfire effect because there is no dismissing of new facts. Another good reason for systematic trading. We often see the same statistics week after week, but every once in awhile you will see something that will make you sit-up and take notice. This is one that caused a jolt. 30% of traders have never seen a full economic cycle. This is like saying 30% of the army has never been shot at. This lack of experience creates a very unstable environment. Regardless of how much you have read, there is nothing like living through the down part of a cycle. Saying this is not a pride issue, but one of experience. Market move and you have to experience that sick feeling when they are going lower and there is no good reason and there is no place to hide. Even worse is when there is a good reason but there is nothing you can do about it except work as hard as you can to take advantage of the sell-off. You have to be prepared, do you your homework, and then be ready when other may lose focus. Market sell-offs in a down cycle are sharp and fast. Higher volatility is expected. Down cycles are not the same as the slow trends when markets rally. Decisions have to be made fast. This is another reason for why disciplined and systematic is helpful. It can serve as an alternative to experiences not lived. All CTA managers are not created equal. There is more to this strategy space than just trend-following although trend-followers represent the majority of the assets under management. 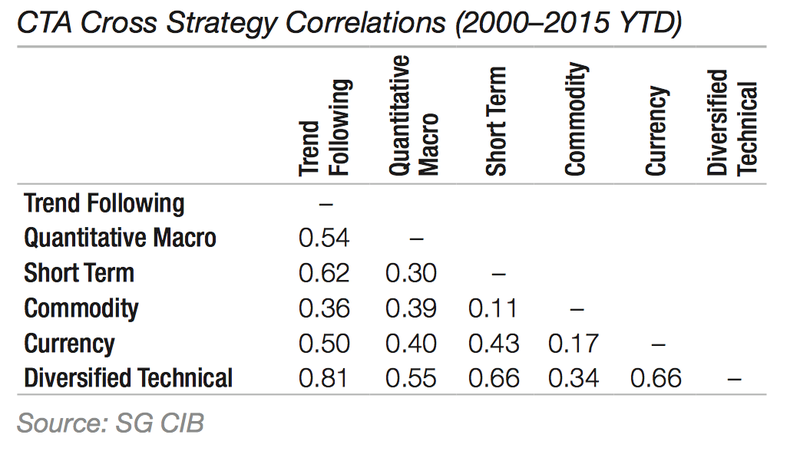 A recent study earlier this year by SocGen looked at the correlation across a number of managed futures strategies and found there is strong variation in their return behavior over a fifteen year test period. The managers that specialize in a specific asset class will have lower correlation with other managers only because it is less diversified than most trend-followers. 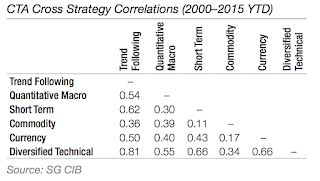 For those managers that may have a diversified portfolio, quantitative macro is the least correlated with trend-followers. The volatility of these CTA strategies will also be markedly different. Trend-followers will be the second most volatile strategy next to commodities. Of course, commodities are more volatile than financial markets given the high underlying volatility, and as a strategy focused on one asset class, it will be less diversified. The best returning category is the diversified technical group which can have both trend and counter-trend components. The second highest return strategy is trend-following. A broad set of different strategies are available in managed futures and may offer as much or more diversification as managers within another hedge fund strategy. Often information on central bank behavior is right in front of you if you look. Reading a piece developed in March for the Brooking Papers on Economic Activity by Chicago Fed president Evans and his staff gives a clear indication about how caution plays out with monetary policy. The paper is called "Risk management for monetary policy near the zero lower bound." It has a nice simple model and some good analytics, but my focus is to get at their thinking. The Evans argument is that when forecast uncertainty is high, the downside of raising rates in a weak economy is much higher than the risk of higher inflation. The forecast uncertainty will increase when the output gap is larger, so if you have a large output gap, good monetary policy risk management should call for a delayed lift-off of rates. Evans uses the periods of '97-'98 and '00-'01 as examples of this prudent central bank risk management. He argues that there is a history for this risk management that dates back to Greenspan. There is nothing is new with this policy approach and there is precedent for delayed action. I believe that this argument has carried weight with others at the Fed and is the current driver for slow behavior. When in doubt with output gaps, the right strategy is delay. I will not argue on the correctness of this strategy. It is current Fed thinking. Trend-followers versus managed futures - Is there a difference? Investors can look at existing managed futures indices to get an idea of how trend-followers compare with managed futures. Some will ask the simple question is there a difference? The answer is yes. Managed futures is a much broader strategy than just following trends and will provide unique returns and diversification value, but the proof of the difference is in the data. We compare the SocGen managed futures index which represents the 20 largest CTA managers against the trend-follower index from SocGen which includes the 10 largest trend-following managers. The trend-following index is a sub-component of their managed futures index. All ten of the trend-followers are in the larger managed futures index. The SocGen managed futures index without the trend-followers will be the CTA index of other strategies. The first graph shows the NAV of each index to show the overall performance between the two. They will be closely correlated given one is a subset of the other. 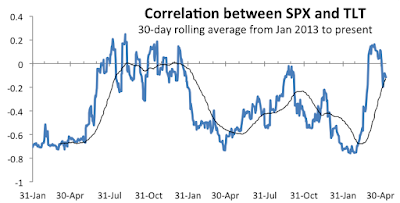 The correlation is above .95 for any rolling 250 day period. However, there are periods of significant return differences. To better illustrate the differences, we have plotted the excess return of the trend-followers over the managed futures index. You can see there are clearly long periods periods when trend-followers will do better like the last year. In fact, the trend-followers do a lot better than the CTA index in the long-run. Nevertheless the annualized difference is under 2% per year. To get that higher performance, trend-followers do take on more risk. The volatility of the trend-followers is significantly higher although the difference has closed. The drawdowns for trend-followers are also greater than the managed futures index. All managed futures managers are not alike. Therein value in finding a mix of managers beyond trend-followers. Fining other strategies will dampen volatility and cut drawdowns and even though there will be some sacrifice in return, the impact is not large on an annualized basis. 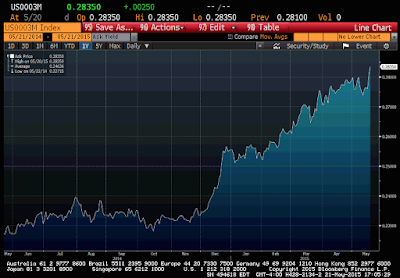 Do retirees need global macro / managed futures? There are some simple rule of thumb for asset allocation based on age. One well-known approach is to set equity allocation at 100 minus your age. If you are 60, your equity allocation should be 40%. If you are 30, the allocation should be 70%. Without setting up any straw men, we will say that the rule for most advisors is that the older you get the more you should switch into fixed income. Most new robot allocators will likely follow some age adjustment algorithm. The target date fund business have all been addressing the aging asset allocation process through creating set maturities. The pie chart above is a typical allocation scheme based on age. Aged investors will hold more of the "low-risk" assets that are supposed to generate more cash flow. It has been a driver of billions in asset allocation flows, but it may have been driven by a financial world that no long exists. Allocations to cash have generated no money and with any inflation, the real return is negative. The Fed has wanted you to get a negative real return. In fact, they would like it to be more negative. Bonds, the safe asset, have limited yield and could face new risks if the Fed starts to raise interest rates. These arguments are not new, but are relevant in the current potentially changing environment. The assumption for holding bonds is threefold, safety through a less volatile asset, interest income through coupons, and diversification through low or negative correlation with equities. All three of these assumptions may prove to be wrong. 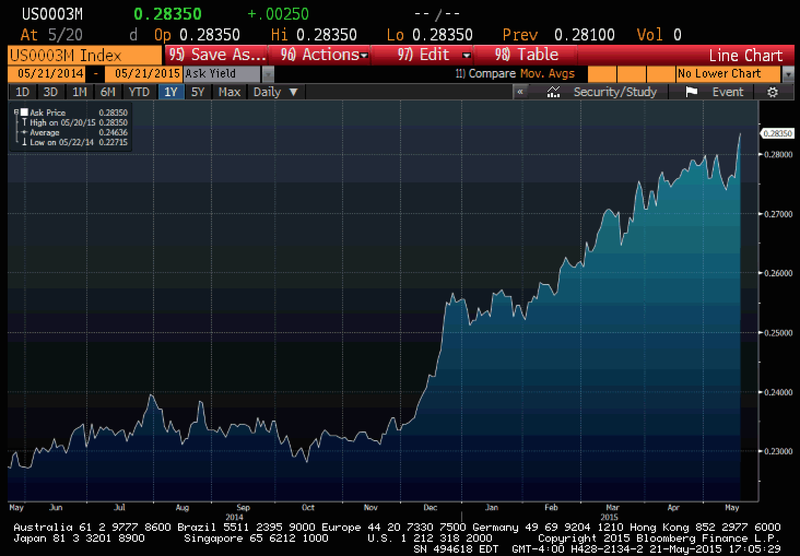 Bond volatility has been increasing and their safety has been called into question if rates rise. The low rates for the last few years has limited the yield from fixed income, and more recently the correlation between stocks and bonds has increased. Is there an alternative to bonds that could help preserve wealth for older investors? If the macro environment changes to a rising rate, reduced monetary liquidity market, there are advantages with global macro and managed futures. The advantage for investors is simple for these macro strategies. Further diversification beyond bonds and the ability to short fixed income in a rising rate environment will help provide portfolio protection. These strategies will provide lower correlation and a potential hedge for equity and bond allocations. This may seem counter-intuitive for some, but principal protection of portfolio is all about diversification in a complex environment. Nomura has generated some provocative work on the value of active management. A lot of the value is affected by whether the analysis includes fees, but within the work are little nuggets on how investors should look at active management. It may be more effective to think about active management within the context of the macroeconomic environment. 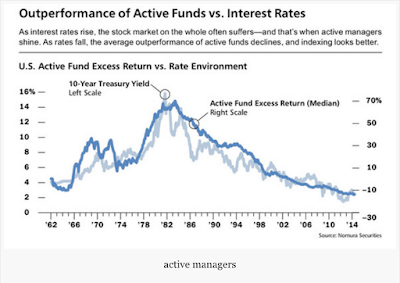 When rates are rising, active management works, when rates are falling, index investing is more effective. When the rates back-up, the discounted value of cash flows will decline, so a broad set of stocks bundled in an index may underperform a portfolio that is actively selected. What this tells us is that if the interest rate environment is expected to turn up, allocations to active managers make sense. Obviously, this also applies to alternative investments. Hedge funds are active managers to the extreme, so looking for alpha producers in a rising market should maximize their benefit. This could a good reason for why there is a such an interest in global macro and CTA's. Simple beta exposure may not be prudent in a changing rate environment. This result could a monetary policy effect, it could be a discounting or leverage effect, or a changing inflation effect. 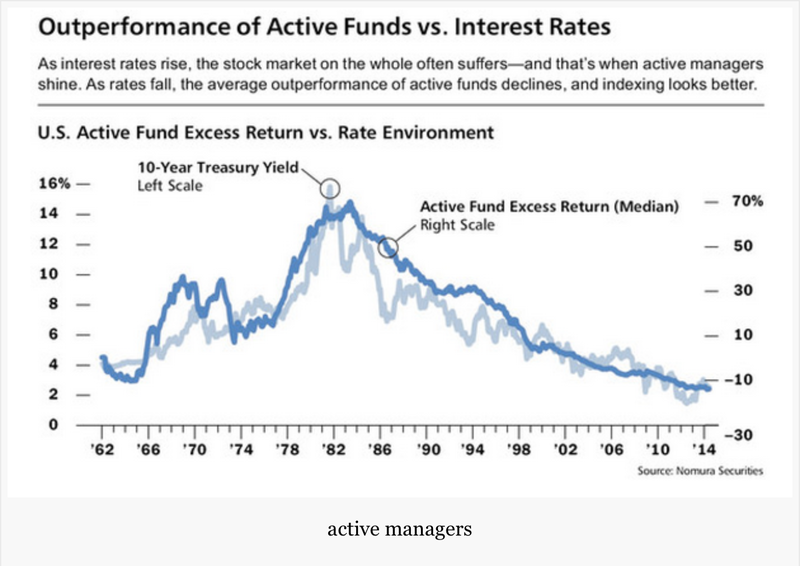 More work on this issue is warranted, but the evidence and theory seems to be consistent with the idea that active management is beneficial when rates rise and monetary policy may be turning higher. Fed audits - Does the central bank have skill? There has been a significant amount of talk earlier this year about a Fed audit bill in Congress. It has meant many things to many people. We know without doubt that the Fed is against any type of audit and a serious challenge to the Fed policies has been averted at this time. An audit bill would have been an infringement on its central bank independence. There is great potential for politicalization of the central bank; however, there is a clear question on whether the Fed is doing a good job. An audit bill is about power and power determines direction, but if there is no clarity on success at reaching goals, it seems as though review is necessary. There is Congressional review of the central bank through testimony by the Fed chairman on its ability to hit its targets on inflation and unemployment, but there is little or no review of the work product that is produced by the Fed. A simple example is whether their forecasts are any good or whether the regulation that they place on banks are effective. Does the Fed hit their mandate? Is a delay in any rate rise appropriate? Does the regulatory powers employed improve financial stability? Perhaps there could be a better use of existing law, but whether the Fed is effective based on better oversight of government is not a wild idea. Equilibrium interest rates - who knows what it is? In the paper, Equilibrium Real Funds Rate: Past, Present and Future, by Hamilton, Harris, Hatzius, and West, we have our best empirical review of thinking on this rate complex issue. The combination of academic and Wall Street economists provides a very readable story on changes in equilibrium rates. This has become one of the most important issues in macroeconomics, monetary policy, and fixed income trading. Focusing on the fixed income trading issue, the equilibrium real rate is the foundation for any work on fair value bond asset allocation analysis. Simply put, if the equilibrium real rate is or should be 2%, we are looking at a rich bond market and allocations should be cut. If the equilibrium real rate is closer to zero, then we do not have a market that is rich. Billions in asset allocation flows rest on this question. Of course, this fixed income issue may seem trivial against the broader monetary policy issue. 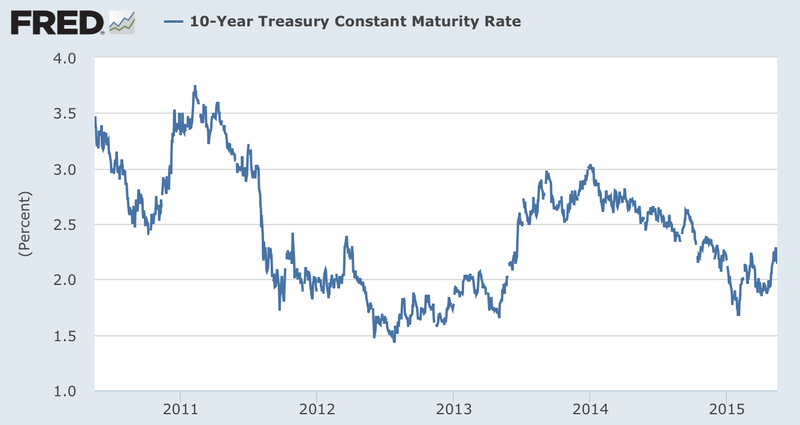 If the equilibrium real rate is at or close to zero, then waiting on any normalization make sense. If the rate is closer to the trend rate in GDP, it is time to start raising rates. This policy also ties back to what traders should do in the fixed income asset space. Normalization is going to be a slow process. The conclusions from the Hamilton study tell us there are no simple answer to what the equilibrium real rate should or has been. The lessons from history tell us any simple answer is a glib response to a complex problem. The authors go back in some cases to more than a hundred years of data across a wide set of countries to look for what should be considered the neutral rate of interest. The uncertainty of what could be considered the equilibrium rate is very high. There is no easy rule of thumb and the link with then GDP is not strong. The equilibrium rate could be at the 2% pre-crisis consensus or it could be closer to zero. There is not enough evidence to say one way or the other. That said, the argument that we are in a secular stagnation is hard to agree to. The evidence associated with the real rate against the period of secular stagnation do not match. We do find that the equilibrium rate can change quickly and that growth can also change quickly once economic headwinds are removed. 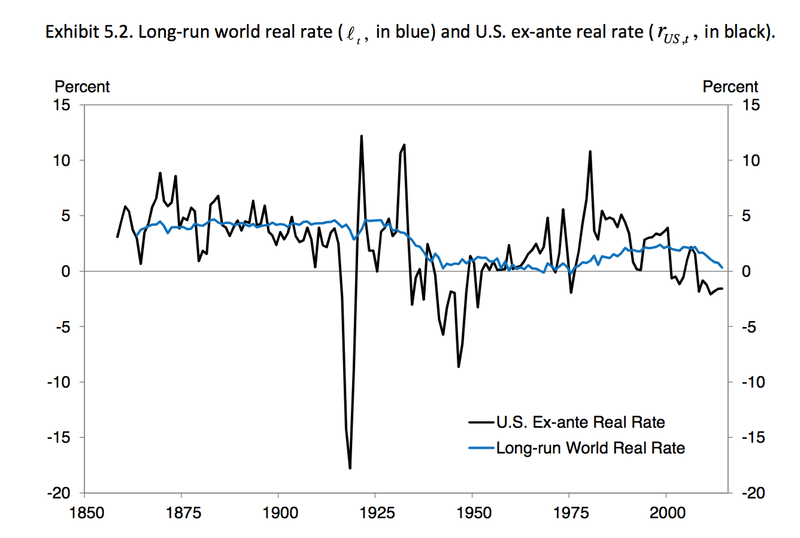 However, the positive link between trend growth and real rates is weak. 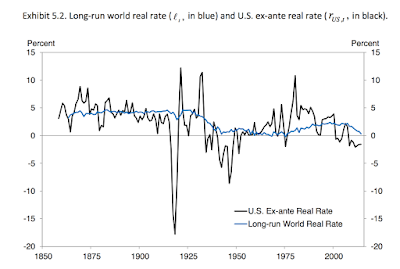 There is no long-term mean for the real rate and at best there is a mean-reversion to the world real rate which itself changes over time. These issues are only compounded by the problem of a zero bound; nevertheless, the evidence still point to a positive equilibrium real rate. The policy conclusion from this strong group of economists is that "inertial" monetary policy is the wisest course of action. If we cannot predict or know the equilibrium rate, then a go-slow policy is prudent and thoughtful. 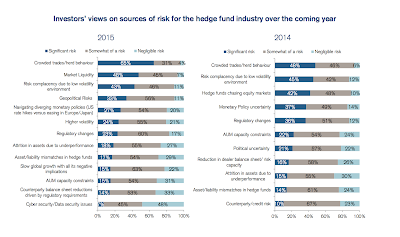 The Credit Suisse 2015 hedge fund investor survey provides some insight on the fears of hedge fund investors. It is not higher volatility. It is not monetary policy. Nor is it geopolitical risk. The number one issue is risk from crowded trade and herd behavior. Th number two issue is market liquidity. These may seem odd at first, but it actually shows a deeper understanding of risk in alternative investments. There has not been enough work on defining crowded trades. We do know that is a bigger problem and hedge funds get larger. It is an uncertainty and not a risk that can be measured. We can look at SEC reports and commitment of traders, but there is a dearth of information on what hedge funds are doing in aggregate. Hedge funds want it that way, but it also increases the uncertainty faced by investors of what the hedge fund industry is doing in a sector or name. Transparency with a manager can tell what that firm is doing, but it cannot tell us what the crowd is doing. Tied with crowded trades is liquidity. 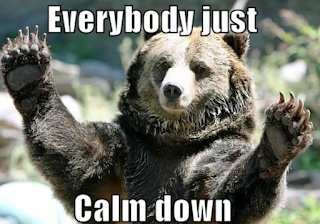 If everyone is thinking the same, there will be no liquidity. This a fear in even the most liquid markets. The big risks have been identified, but there is no easy solution on how to address these concerns by hedge fund investors. The Credit Suisse 2015 survey of hedge fund investing appetite showed a marked change in demand with Global Macro being the number one strategy in demand and CTA's coming in number three. The other three strategies in the top five are event driven, long/short fundamental equity and equity market neutral. 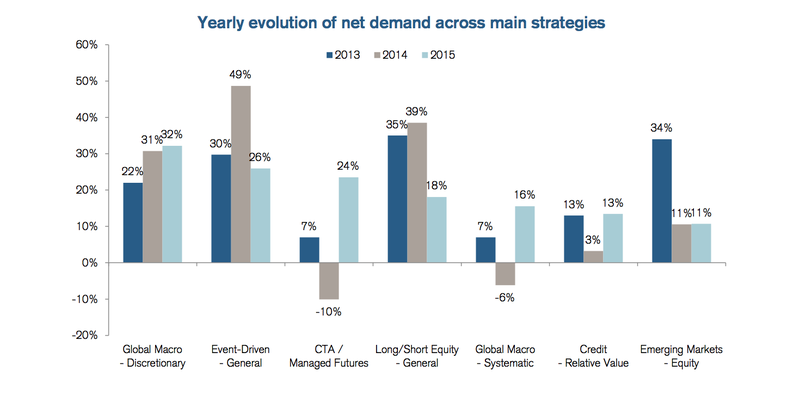 The strategies that are least in demand are leveraged credit and convertible bond strategies. A look at the change from the prior year shows the three biggest increases in investor demand are with managed futures, global macro, and commodity strategies. This increase in demand is coming at the expense of equity strategies. The three key factors that are driving demand decision by hedge fund investors are: high net returns, low correlation, and reduced volatility. Investors will receive those factors from higher allocations in global macro if there is corresponding increase in volatility across all asset classes. It is often hard to say what are the specific drivers for demand in global macro beyond a higher volatility environment. We will suggest that there are two major reasons for the increased appetite, an increased in interest in currency and fixed income. For currencies, the divergence in monetary policy across the globe is causing currency volatility and opportunities to increase. For fixed income, an expected back-up in rates from Fed normalization means fixed income trading outside of credit is back in vogue. One of the reasons given for the EU bond market sell-off has been the view that the ECB will not follow-through on their QE program of consistent monthly buying of 60 billion euros in bonds. 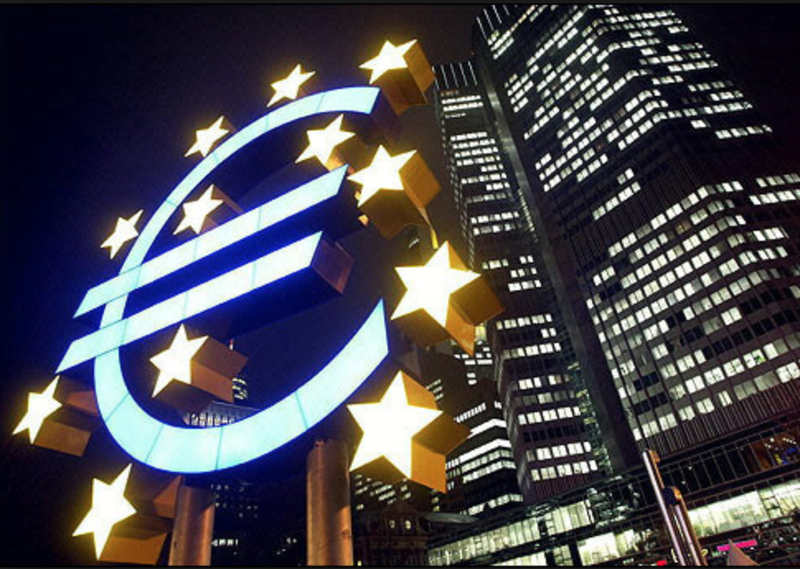 The ECB has had to send signals that it will continue to act regardless of current growth and inflation numbers. On the 15th ECB president Draghi said that ECB stimulus will last "as long as needed". "While we have already seen a substantial effect of our measures on asset prices and economic confidence, what ultimately matters is that we see an equivalent effect on investment, consumption and inflation, ... We will implement in full our purchase program as announced and, in any case, until we see a sustained adjustment in the path of inflation,"
This is a clear monetary announcement with no ambiguity. We can call this true monetary transparency. ECB has also sent signals to the market that it will front-load some of its purchases that were to occur in the summer. It is doing this so as not to disrupt the markets during the summer season, but it is a clear means of reducing the markets sell-off. Finally, this week-end President Draghi argued for structural reform in Europe for labor markets to lower unemployment. This is an important point often missing with policy-makers. Monetary policy provides for a better environment for reform and should not be the sole catalyst for growth. Should rates move higher under the assumption that demand will increase, growth with improve, and inflation will be higher? The answer is yes. Should there be a bond sell-off because the ECB is not resolved to buy bonds and continue its policies? The answer is no. It may not seem like much but there has been a strong march higher in LIBOR as debt markets prepare for Fed normalization. The markets are clearly preparing for higher short rates even if longer maturity debt is more mixed in its movement. Although this increase is small in absolute terms, it is significant relative to where we have been over the last few years. The forward curve is showing even greater upward movements. We have argued that the Fed is biased for delay, but it worth realizing what happens when this LIBOR trends starts to dominate short rates. Eurodollar futures trading will see significant increases, swap activity will increase, hedging will start to be considered, option vol will increase, option trading strategies using out of the money strikes will see large increases, and short maturity investing will pick up. Regardless of rate movement, trading activity will be on a significant rise to levels not seen in years. Many consider the EU bond sell-off in Europe an ECB taper tantrum; nevertheless, there was nothing that would suggest that the ECB would change course with their QE bond buying program except for better economic number. The ECB has not said it was data dependent like the Fed. In fact, the ECB will front-loaded some buying ahead of the summer season. With the US markets also selling off, the spread between the two markets has closed but it is still not anywhere near the levels seen three years ago. If we mark the taper tantrum as a key point in May-June 2013, the spread difference is mainly about the differences in policy. The widening of the spreads was associated with the realization that the ECB would follow a QE programs and the Fed would start normalization. A delay in a Fed rate rise will close the spread gap. A view that the plans of the Fed are back on track will lead to a widening or at least a stable spread. Watch the spread and you wilt a feel for European expectations on Fed behavior. There is again talk that the 2% inflation target that is used by many developed countries is too low. Of course, we have not hit that 2% target and inflation has generally been moving away from the target, but now some central bankers think it should be raised to say 4%. This is a topic that has been floating around for years starting with IMF chief economist Olivier Blanchard in a provocative research paper. This is all about central bank creditability. In the 70's, central banks lost all creditability as inflation fighters. It took the Fed's Paul Volcker to push rates to unprecedented levels to break inflation expectations. The 1990's heralded the period of inflation targeting with the level almost universally set at 2%. Central banks were able to reach their goals during a period of macro calm, the Great Moderation. The markets believed that central banks could and would hit the 2% target. Now, central banks think they have done too good of a job and they need to get inflation expectations to a higher level. With higher expectations, the real rate can be pushed lower which is what the central banks want. By forcing real rates down to the equilibrium rate or below, the monetary authority could stimulate growth. of course this assumes that nominal rates do not increase in lockstep with the increases in inflation. This is all nice in theory, but do we want a breakdown in central bank creditability and do we want to actually face inflation significantly above 2%? If this high inflation view became the policy of the land, fixed income markets will be in a world of hurt. There are supply and demand shocks that can disrupt markets as well as VaR-shocks which may be every bit as painful for money managers. The manager who runs his risk management based on VaR looks at an amount of loss for a given probability for a set time period as a target for maximum risk exposure. The VaR is a function of three things, the size of the positions, the volatility in the markets, and the correlations across markets. The VaR is the threshold at which there will be an automatic sell-off of exposure so as to reduce portfolio volatility. The VaR will be the market-to market loss over a fixed horizon given a known distribution. If VaR for a hedge fund is kept constant, a lower market volatility will lead to bigger positions. If the volatility or correlations of the markets increase, then to keep VaR constant there will have to be a decrease in positions. Hence, a longer-term low volatility environment will have more risk-taking. But, if volatility starts to increase positions have to be exited. When there is a low volatility environment, firms may increase position exposure through the use of higher leverage. In cases like these, small changes in volatility can cause a cascade of deleveraging based on VaR levels being breached. It can easily be argued that a VaR-shock could be worse than a supply or demand shock because the spillover across markets can be more significant. 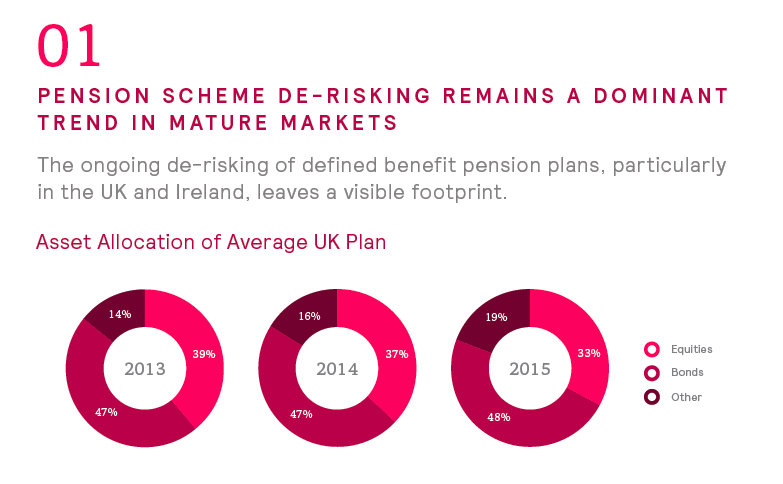 Position risk has to be reduced and the cuts may come in unexpected places. A VaR shock can create a positive feedback loop. The attempt to maintain the VaR level may mean further volatility increases will translate into further positioning cutting - the dreaded feedback loop. Once selling starts it can continue as more markets are caught in the sell-off. This is one of the reasons why there should be a so much focus on the current European bond market sell-off. VaR shocks are hard to manage not because we don't understand the risk principles involved but we don't know the reaction to shock. For example, trend-followers love trends, but a VaR shock may start generate price moves in markets that are totally unexpected. Existing trends are reversed. This was the scourge of the risk-on/risk-off period. For banks which deal almost entirely in the debt markets, a VaR shock in bonds is an especially difficult problem. Illiquid assets cannot be sold so the focus gas to be on the most liquid bonds which are also benchmarks. This is a feedback loop that spill-overs across the entire macro-economy. What can we expect from global macro managers? 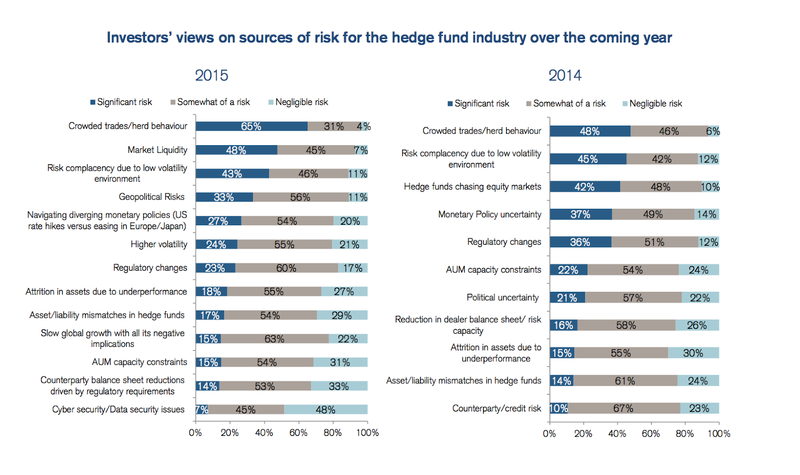 The new Neuberger Berman Hedge Fund Perspectives 2015 research piece provides some useful insights on hedge funds. There is a strong view that global macro may be a useful strategy even after disappointment over the last few years. The hedge fund market has seen the ascent of trend-following CTA's over the last year and it may be time for the trading and asset class rotation skills of global macro. There were two graphs that piqued by interest. The first shows the performance of global macro during periods of Fed tightening. Global macro will do better both on an absolute and risk-adjusted basis in rate rising environment. If the Fed normalization plan is coming, global macro may be able to effectively exploit fixed income opportunities. The 2015 Mercer survey of European pension funds shows that the "great rotation" has not been between stocks and bonds but between risky beta and alpha. UK allocations have de-risked, but the process has been through cutting equity exposure and adding alternatives. The survey data suggests that the search for yield has not occurred as expected. There has actually been a search for better risk adjusted return. In the old days, you could de-risk with bonds because you received carry through the yield. Without any yield, the cost of lowering risk is too high. In order to reduce the cost or expense of lower risk, investors have embraced alternatives. Investors may be looking for skill in alpha; however, the real flood into alternatives may also be driven by a poor alternative in fixed income. Is this really an investment twilight zone? Bank of America has come out with a provocative phrase for the period between the end of QE and the beginning of the normalization of rates by the Fed - the Twilight Zone. 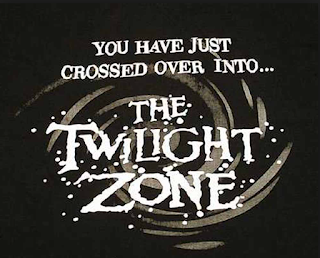 The twilight zone is an economic environment of "secular stagnation" and low inflation. The economy may not be strong enough to cause the Fed to act nor is it at place where it can handle a rise in interest rates. The twilight zone does not have more securities added to or taken away from the Fed's balance sheet. 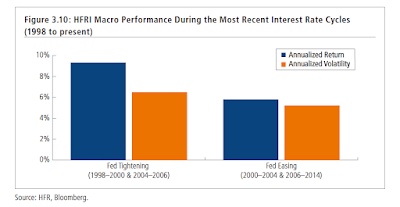 The twilight zone has abnormally low interest rates, continued use of leverage, and further risk-taking, but also a sense of dread concerning asset prices. It is a time when plans do not want to be made because the true discount factors are not apparent. The twilight zone has markets addicted to zero rates and cannot support financial markets in another interest rate environment. This is a no win environment. If the economy does not show more robust growth, risky assets will not be able to be held on a fundamental basis. On the other hand, early action by the Fed will force asset prices lower as leverage and risk-taking is reduced. 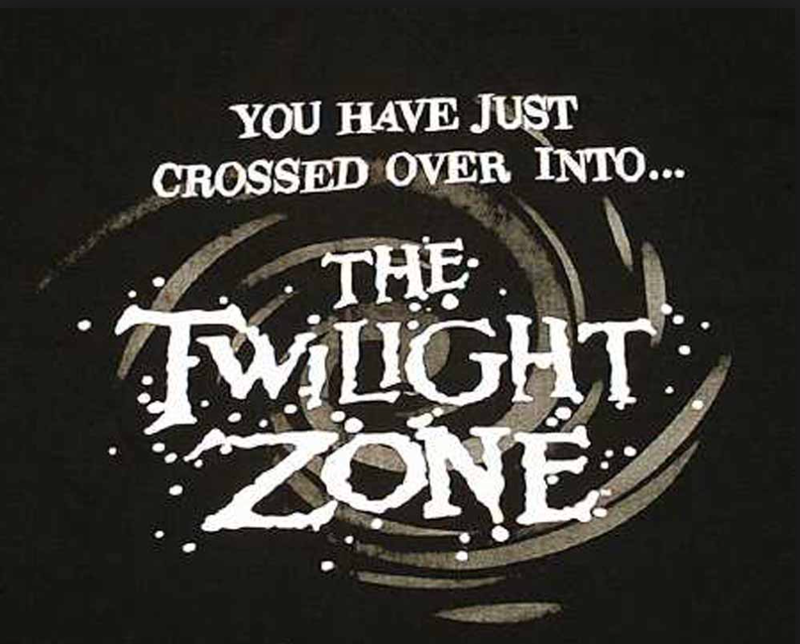 It is no wonder that the Fed wants to wait before leaving the twilight zone and entering a new reality. The course of action for many investors should be to prepare for tail events now. Raise cash levels, hold any cheap liquid assets, and look for uncorrelated opportunities. Stay away from the traditional assets which have been the receivers of capital flow looking for yield. Bernanke on QE - wrong in practice and theory? The markets will have another test of QE through the ECB, but what determines success with non-conventional monetary policy? QE in practice and theory seems to have issues. We may find that success is especially hard to measure if we believe the problem has to be reviewed through an entire cycle. We cannot say QE is a success until the QE cycle is finished, and it is becoming hard to decide when the cycle should be reversed. Six years after the beginning of the recovery we still do not have enough data to say that the QE experiment should start to be reversed. We have stopped adding to the Fed balance sheet, but cash from principal and interest will still be reinvested. 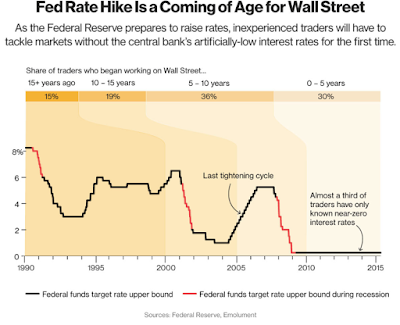 It seems as though the earliest the Fed increases rates will be September, so how will this experiment end. Could it be through a slow transition to normalized rates or a volatile path involving market tantrums? My bet is on a transitional tantrum. Equals are usually never as good as the original; however, we may be surprised with Taper Tantrum 2 which is now playing in Europe. 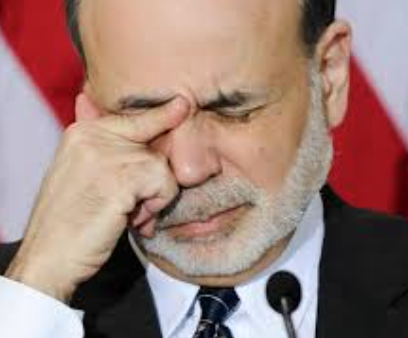 The first Taper Tantrum occurred when Chairman Bernanke suggested that it was time to end quantitative easing on May 22, 2013 in testimony before Congress and on June 19th at a press conference. 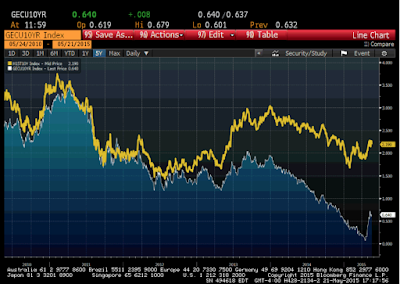 The sell-off was significant as noted by the 10 year yield change. The best simple description of the impact was that it caused a rate rise of 100 bps. By that measure we have more room for an increase. Is this time different? The first Tantrum was somewhat of a surprise for the market, but the implications were less serious. The ending of QE3 was the first step in the normalization process but was not immediately associated with a rate rise by the Fed. The market, after it fully digested the news, rallied through 2014 by 100 bps with the belief that normalization would begin in 2015. This Tantrum has started with EU bond markets where rates exploded on the upside from extreme lows. Some have suggested the cause was a change in sentiment which is catch-all phrase. Others have pointed to the fact that there was the belief that the ECB would not follow-through on their QE program. With rates rising in the EU, US rates were carried along even with slower growth and a delay in expectations. What is unusual is the fact that a Fed delay based on slower data is now associated with a bond sell-off. This is different than the first Tantrum. We have one of the largest central banks in the world telling investors that they don't have much impact on exchange rates and global capital flows. This is just too rich. This is not an issue of policy coordination but a simple fact that the largest central banks will have spill-over effects to the rest of the world. The size of the spill-over is a matter for empirical analysis, but the foundation is that changing policy and rates in the major currencies will impact global lending. One of the main objectives of central banks is to impact rates and currencies in order to cause greater domestic growth. It is hard to believe that a large central bank would say they do not have international effects. 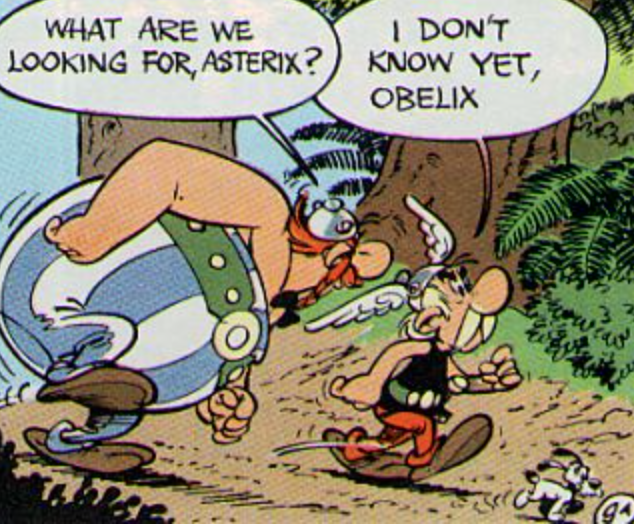 Of course, it seems to be the rule that central banks do not discuss outright exchange rates. What is the talk of currency wars all about other than that central banks have international spill-over effects? In the case of the ECB, their QE program has brought down the euro and was expected to do so. The impact will be greater exports and a jolt to growth. It is a matter of size. There are only a few central banks which can and will have an impact on international markets. The ECB will be one of them. His argument that there are no global effects is applicable for smaller countries, but the actions of the Fed, ECB, BOJ and Bank of China will have spill-over to the rest of the world. That is why we have to watch them so closely. 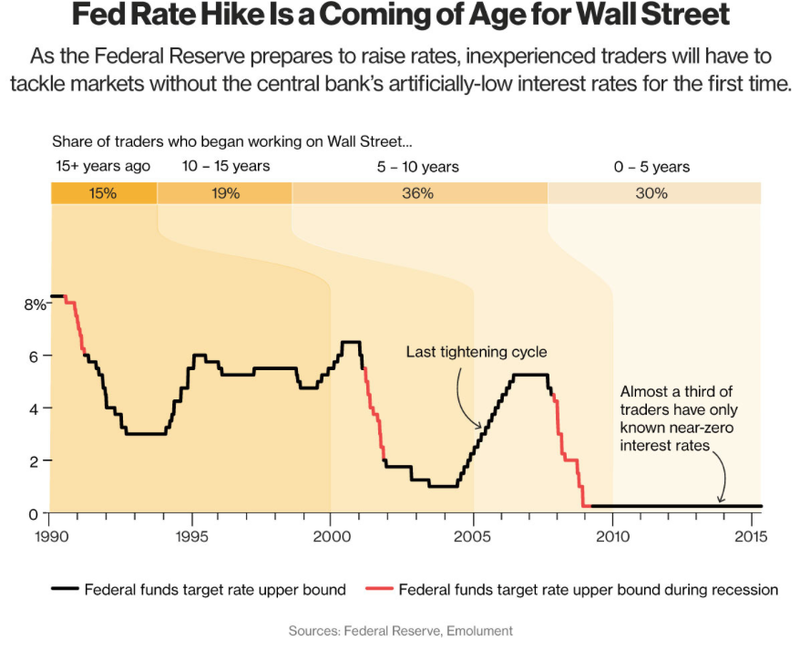 Should the Fed wait or not to wait, that has and will be the question that is the key focus of bond markets. Chicago Fed president Evans gives his opinion, wait until 2106. Evans goes on to say, "It makes sense to favor some overshooting," above the 2% inflation target. So there you have it. Let's break Fed creditability as an inflation fighter and ask for some overshooting. His argument is that if we are under the inflation target we can handle some higher inflation, the cost is modest, and it can be controlled. Evans could be wrong on all three. 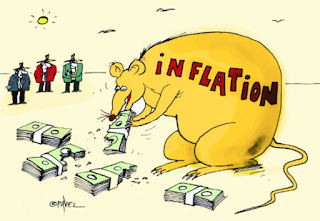 There is no logic that low inflation has to be offset by higher inflation. The cost of inflation is always high if you don't get inflation adjusted wages or if you are a bondholder. We have history that the Fed has a hard time controlling inflation especially with its dual mandates. Comments like these are the catalysts that will send the bond markets lower. If you think that Mr Evans has any sway you should be worried. Fed action in September - follow the economists? Is September the play on Fed action? If you use the most recent survey of economists, September should be the time for a Fed rate raise. 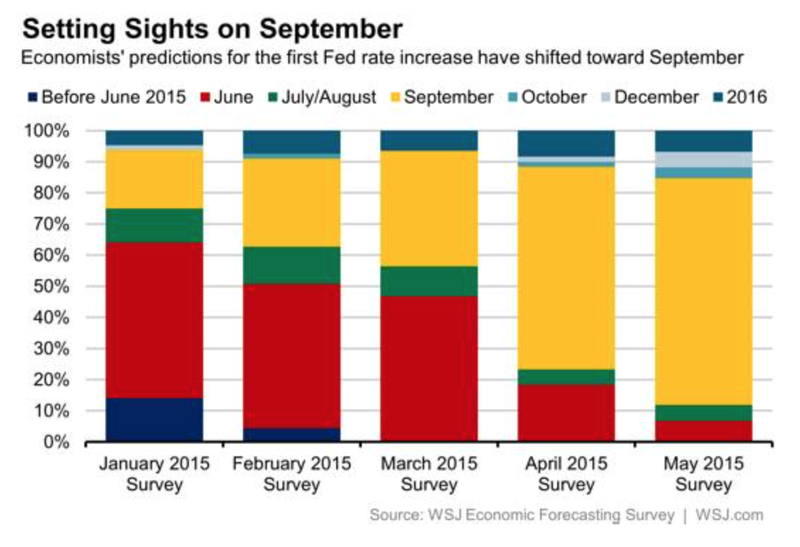 70% of the economists surveyed believe that the September FOMC will be the time for the first move. Of course, if you look at what economists have been thinking since the beginning of the year, you will get a good idea of how far off they have been with their forecasts. We have clearly moved from a median view of June to September as the overwhelming consensus based on weak economic data. If you look at the Fed fund futures, you get a a different picture which is more uncertain of when the Fed will take action. There may be some issues with the calculation used in the CME Fed watch table, but the picture tells us that investors do not completely share the view of the professional economists. The market has gotten burned too many times with expectations of a Fed increases to fully embrace the economist's consensus. There is more probability mass for no action. Traders do have some good opportunities to express their views in futures. Assume that you use September as the key leverage point. Option strategies can be developed to tilt either side of a September action. The play could be to fad a September action and play against the probabilities seen in the market. The recent positive momentum in trend-followers has not been seen in over fifteen years of data. Looking at the SocGen Trend index which started in 2000, we cannot find a better period of trend-follower performance as measured by strength and size of the move. This includes 2008. Of course, the last month has seen a strong reversal which has sent new worries to investors who are fearful of a new drawdown, but performance is still above the long-term trend line. The only reason investors have not felt better is the fact that trend-follower performance has been significantly below the trend line for a number of years. It took this upward thrust in trend to end the market drawdown. We will look at the reasons for this strong move in another post, but first we would like to show some of the basic descriptive statistics for the index through time. While we have seen a strong surge in performance, there has not been a surge in volatility. In fact trend-follower volatility has stayed low based on rolling 250 day volatility. Market volatility has declined significantly over this time, but there could be an argument that trend-followers have become too cautious during the drawdown of the last few years. Volatility is close to 50% below long-term averages. The cautious argument is based on the fact that managers can target their volatility in futures regardless of the set opportunities. Behavior of trend-followers has also show less negative skew in their performance. There has been the recent view that trend-following has negative skew based on momentum crashes. Markets have a tendency for trends that face quick reversals. There have been less momentum reversals in the index data, but if trend-followers have taken less risk, there will also be less negative skew. Kurtosis is a good measure of surprise risk. If there are bigger tail moves, there will be more kurtosis or peakedness in the distribution. Again, we have found there has been less extreme moves which suggest that risk-taking has been down. 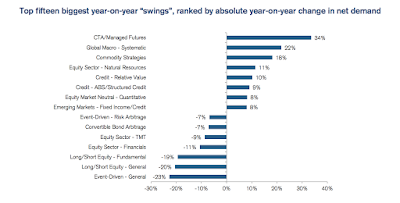 What is surprising is the lack of extreme moves even when trends have been stronger and performance has been positive. It could be that trend-followers have gotten better at risk management given the decline in skew and kurtosis as well as volatility. The drawdown chart provides the best explanation for why investors have been hesitant to invest in managed futures trend-followers. The long deep drawdown pushed investors away from this hedge fund strategy. The index mostly spends time in a drawdown with intermittent spikes in performance. This is what causes concern with investors who are loss averse. Drawdowns often call for investment behavior that is contrary to conventional wisdom. Investments should be made on dips not new highs. The index shows that managers may have become more risk averse as it faced a long drawdown. It also suggests that risk management has improved for managers in this strategy space. The question is whether this lower volatility behavior will change again. The investment world has lived on the glory of the 60/40 stock/bond asset allocation. The driver for the success of this approach has been simple. A low or negative correlation between stocks and bonds made bonds a safe asset to offset the risk exposures in stocks. It also had the characteristic of being less volatile than stocks. This blend makes perfect sense except for the two simple assumption that have turned wrong. The negative stock-bond correlation has moved up. The safe asset of bonds has not been so safe in terms of risk. 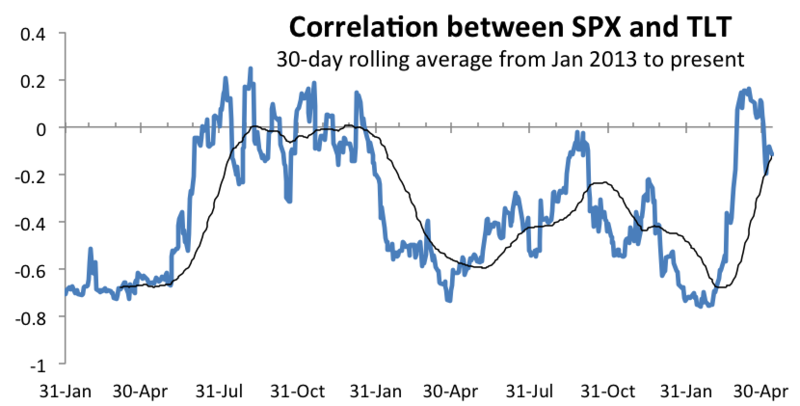 The chart shows the rolling 30-day correlation between January 2013. The correlation between stock and bonds has been highly variable but generally negative. The correlation recently has shown a steep rise. The recent decline in correlation has occurred because of the decline in bonds without a corresponding decline in stocks. The trend in correlation has still be up as measured by a simple moving average. The 60/40 blend has worked well in the past but that does not ensure that it will work well in the future. The simple allocation mix may not be the best alternative in a changing financial world. The fixed income world has moved very far in 2015. In the first quarter, the key issues were deflation, falling oil prices, action by the Fed, a new QE program by the ECB, and talk of secular stagnation to name just a few major themes. 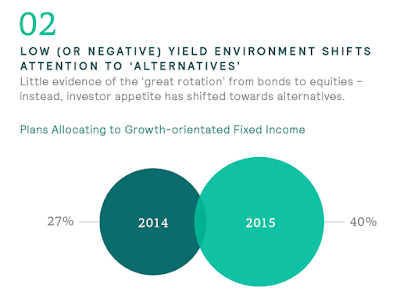 Fixed income was still considered a safe asset even at negative yield levels. That has all changed. There is no one single event that is driving bond markets to higher yields. In fact, analysts have not found a smoking gun for causation. This has just added to the uncertainty. The market would like to point to a single cause and it does not exist. 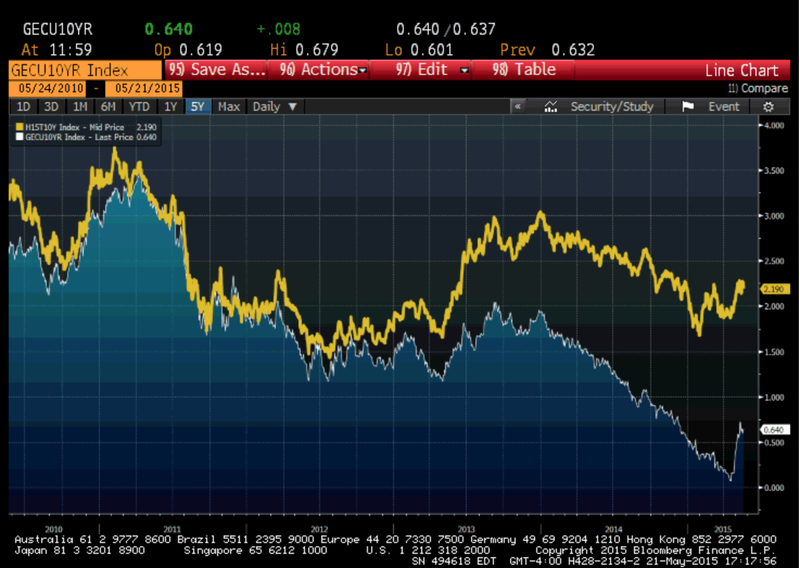 I will call it the "revenge of the bond risk premium". Risk premiums in bond markets have always been hard to measure but it has been clear that they has fallen significantly and in some cases measured to be negative. Whether measured by excess returns, by the residual after inflation expectations and growth, or devations from the average of short rates, bond premiums have hit extremely low levels. These levels cannot be sustained and are subject to changes in uncertainty and volatility. It does not take much for bond holders to sell assets when the yield cushion is close to zero or negative. All you need is a change in mass expectations and some momentum trading. If we go back to the original list at the beginning of the year mentioned in the first paragraph most would agree there is more uncertainty on all of these issues. China - the "robust" economy that the government needs to continue to support. Forget the cause story and accept the world of deleverage and no safe asset. One of the key behavioral biases we face is loss aversion. The pain of losses is much greater than the pleasure from gains. Economist have been doing a good job of trying to form laboratory experiments with controlled subjects to measure these behaviors. 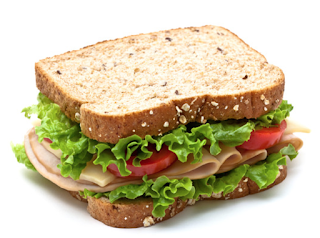 A recent paper in the American Economic Journal: Microeconomics provides strong experimental evidence on loss aversion through consumer choice between sandwiches. This seems like a good real life situation. The subjects have a choice between two different sandwiches. There may be clear taste differences. The question is how much you will pay for the sandwiches when you do not know their prices, or how do you match your tastes with the price you pay. 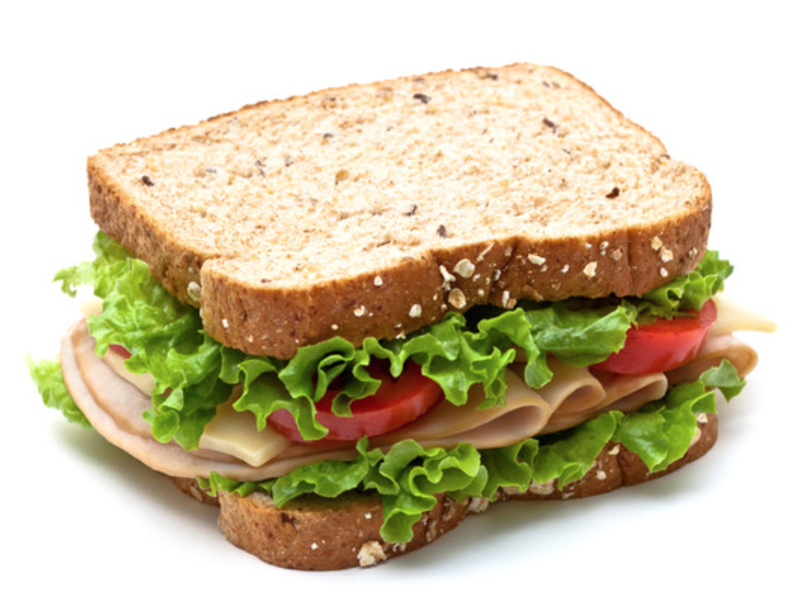 You don't want to overpay, but you want to buy the sandwich which you have a taste for. The experimental results show that uncertain prices will influence your purchase decision. This seems logical, but the interesting part of the test is how those choices are made. There is an equal choice of each of the sandwiches being the cheaper one. Consumers learn the price and then have to make a choice. The loss is paying a high price versus expectations for what is considered the inferior sandwich. The results show that more loss averse consumers will likely eat the cheaper sandwich no matter what. If the taste is very important, the consumer will never choose the cheap sandwich. Those that place little importance on taste will choose cheap. Indifference to taste will always cause a consumer to go cheap given loss aversion. Strong taste preferences may offset the demand to go cheap. This tells us a lot about marketing any product even in money management. Investors will choose a cheaper manager alternative if they do not have strong taste preference. You have to create a taste difference if you want someone to not take the cheap alternative. Define your investment edge if you want to get your 2/20 hedge fund fees otherwise loss aversion will lead to buying cheap without regrets. Push this expectations of any Fed action further into the future. 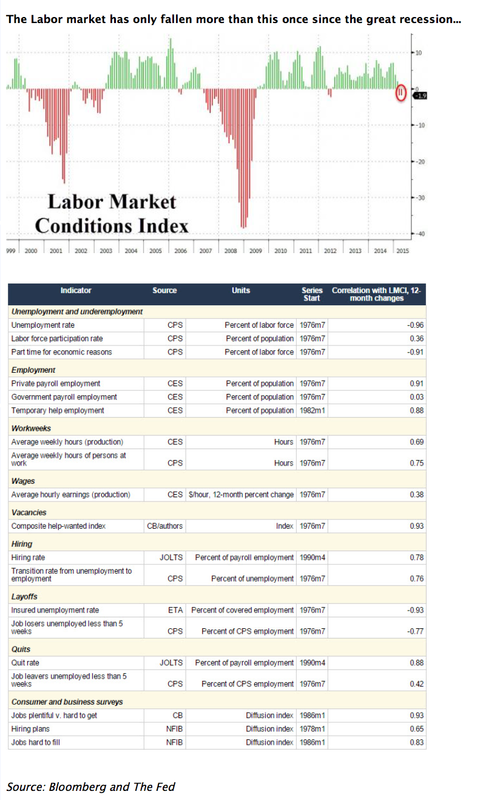 The Fed's labor market conditions index is showing negative numbers that would cause any investor to pause before arguing for a Fed rate rise. Remember that with the dual Fed mandate there are only two things that you have to worry about, full employment as measured by the labor market, and inflation. The labor market was looking robust so the focus was on the low inflation rate earlier this year, but now the focus will be back on labor. The LMCI showed a slight negative reading last month but with revisions to last month and the new number, the index has moved decidedly into negative territory. This is the first time since June 2012 and only the second time since the Great Recession. This number is important if we look at what the Fed did in the middle of 2012. In June 2012, the Fed extended Operation Twist and in September there was the announcement of QE3. If the labor market looks as bad as mid-2012 there is little likelihood there will be a change Fed policy. The Fed will stay the course with no action. 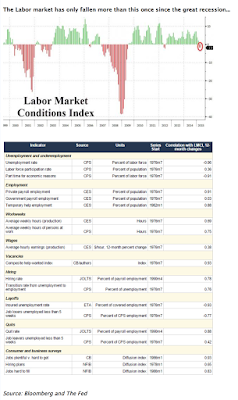 A lot can happen between now and September but we will have to have higher inflation and a much improved labor market before the data dependent Fed will act. There have been significant advances concerning our understanding of risk. Investors are growing more comfortable with the distinction between risk and uncertainty. Along with this distinction is the idea that investors also face ambiguity. There are formal definition of ambiguity, but a good working idea is to think about ambiguity as dealing with problems counting or measuring risk. There is a distribution of prices, yet we are not certain of the value or shape of the distribution. When the probabilities are not know or unclear, we are dealing with situations of ambiguity. We will change our behavior when we face ambiguity. We have know this for a long time. The famous Ellsberg paradox suggests that people prefer decision situations with know probabilities to those where the probability are unknown. We have ambiguity aversion. The risk of not knowing the distribution we are facing makes us more risk adverse. This can be especially difficult issue when dealing with the tails of the distribution. Small changes in our beliefs in the shape of the distribution will have a large impact on the demand for investment products in the tails. Just think of what ambiguity will do with the pricing of out of the money options. Recent experimental testing by Aurelien Baillon and Han Bleichrodt in the American Economic Journal: Microeconomics shows some interesting results that have application for how we should think investor behave. Unlikely events are overweighted and likely events are underweighted. The underweighting of those likely events is higher when it involves losses. The general pattern of tests suggest that there is ambiguity seeking for unlikely gains and likely losses and ambiguity aversion for likely gains and unlikely losses. This is consistent with work done on prospect theory, but gives us more experimental evidence. Investors play for the long shot gains and want to avoid the long shot losses. Their behavior in the tails of the distribution will be driven by the amount of ambiguity faced. Specific skills are needed for any environment faced. The wilderness guide will have a hard time figuring out Manhattan just like the Manhattan upper east side socialite will be truly lost in the Boundary Waters of Minnesota. 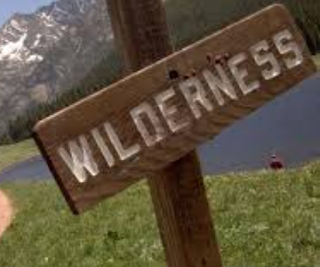 You have to know the environment or terrain to successfully navigate yourself through some wilderness. Everyone get that simple premise. 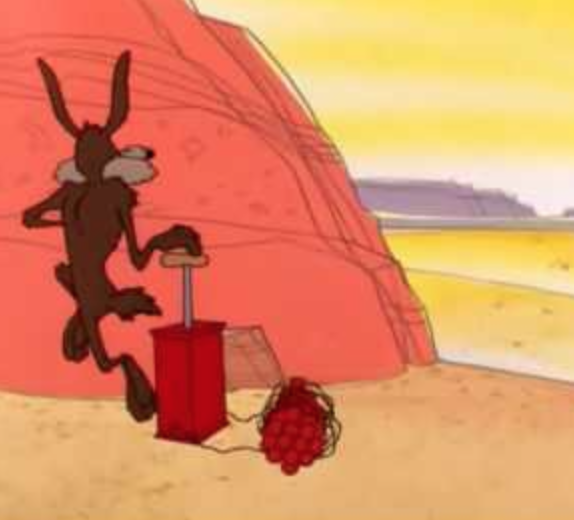 A classic comic device that we love is seeing someone juxtaposed into a strange environment. However, we are not willing to accept this thinking when looking at decision frameworks. The environment for making investment or trading decisions will be different from an environment where there is a a lot of time available to sort through information and choices. This has influenced the work by some the leading decision science researchers and we think it is key in determining how to make better investment decisions. 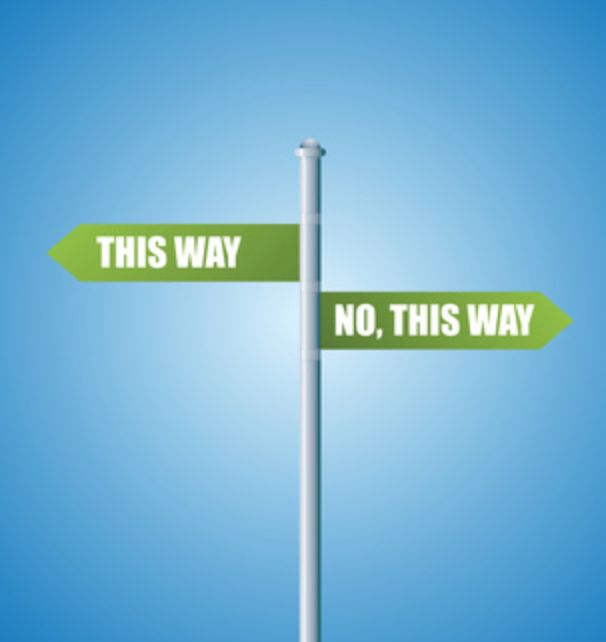 We know that that decision-making can be either fast or slow and the choice is based on the type of problem faced. Rational choice theory or the expected utility maximization can take a lot of time and effort, so there are reasons for making simpler decisions or employing simple heuristics. This is what systematic trading is all about. In a fast paced complex world, make simple choices. Buy what is going up and sell what is gong down. If you lose a certain amount of money, get out of your positions. If you have less information, use price as your guide. A long-term value investor by nature will take longer to make a decision and should not use simple rules. In the value decision, the weighting of all probabilities makes sense. If you need more information, stop and get it. Look for the details and not just the price action. The same applies to those investments which are illiquid. The cost of being wrong is high with an illiquid investment so the deacons should be slowed. For liquid investments, the environment is very different. In a liquid fast paced market, the rules of decision-making will be rational but will be different than the rules of engagement of long-term investing. This is the foundation of ecological rationality. Disciplined and systematic decision-making is often not about learning more finance and economics, but increasing skills at making better decisions. It is not what data you know, but what to do with the data once you have it. It could be about regression or a complex model, but it is often as easy as getting the direction right or just getting out of the way from bad events. One of the key decision skills is learning how to process information and experiences; however, there is a gap between our ability to process risks described to us versus risks that we have experienced. This seems odd but is a reality. If you are told about risks, you will give rare events a higher risk weighting than the actual odds. The very act of describing rare events will increase you belief that they will occur. Put differently, if someone is told the odds of an events and then have to sample or experience the same event, your perception of the event or outcome will be different. The description-experience gap is real and needs to be understand and addressed regardless of what information that is presented to us. More formally, a description of risks is a set of a priori probabilities. The experience of risk is statistical probabilities because there is sampling. There is a continuum between these two. If you only sample and do nothing else, you are at one extreme. If you just describe a set of probabilities without sampling you are at the other extreme. Take the extremes in an experienced risk. If we sample a distribution and we do not experience a rare event, we will give the chance of a rare event occurring very little weight. It was not in the sample, so it will not or cannot occur. The other extreme is placing a probability on a rare event where we have limited or no evidence, only a description. When compared under testing, the description-experienced gap always occurs. We will choose the riskier option when desirable option occurs with higher probability and choose the safer option if the desirable option occurs with lower probability. Experience makes us give lower weight to rare events than objective probabilities. Descriptions will cause us to overweight the rare events which is just the opposite of experienced decision-making. We will overweight rare events described to us and we will overweight the mean or likely result if we sample or experience. We are over-sensitive to rare events that we are told may occur. This has played havoc with decision researchers and cause some food for thought on how you make actual decisions. If there is no descriptive evidence and we have to rely on our experience only, we will underweight rare events. If you mix and match you will get smoothing in between the two results. So what doe this mean for disciplined decision-making an the systematic manager? 1. Look at long sample. Use as much data as possible to experience rare events. 2. Generate scenarios of rare events that may not have been sampled. 3. Acknowledge that there is a gap and adjust to potential rare events. 4. Always diversify so that the chance of a rare event will not knock you out of the game. The bond and stock markets have been moving in tandem at the end of the week with both rallying. The key driver is a further change in expectations concerning Fed action. Expected Fed action is being pushed further into the future. No Fed interest rate increase and stocks have room to move higher and bonds will not sell-off. The market shrugged off the earlier comments by Fed chairman Yellen that the stock market may be overvalued and bonds do not provide attractive returns. It is all about the potential for policy action. Follow the data not the comments. The non-farm payroll number reinforced the view that the data dependent Fed will continue to delay while they wait for the perfect set of numbers. The headline of 223,000 was a good number which was back in line with the 12 month average of over 200,000 jobs. However, the last month number was revised downward. The revision placed the total number of jobs created below the lower end of the consensus. Hence, the total number was not as attractive as expected and caused bonds to rally. An alternative view is that equity investors thought it was a good number and bought while the bonds investors thought it was a bad number and bought. 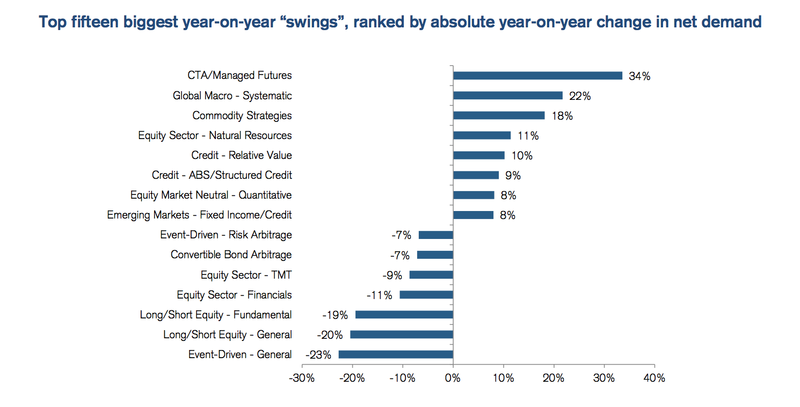 That inconsistency across asset classes does not make sense. The consistent story is a Fed delay. This was further reinforced with the gains to new highs for the week in the front end of the Treasury curve and more muted increases on the long-end. Of course, a real concern is that wages have not really increased and labor force participation has not improved. There are limits to what the Fed can do and there is little help form fiscal policy. The data dependency by the Fed looking for the perfect set of numbers is causing expectations for a delay. The simple table tells us what has happened to the oil market in the last year. The action is all in the whippiness of the futures curve and it has all been in the volatile action of the front-end. The ongoing oil move was more than a short-term logistical supply-demand dislocation, but one of the reasons for the lack of production slowdown is that producers make longer-term decision based on longer-term expectations. In the longer-term, supply and demand will be in balance. A year ago we were looking at a significant market backwardation. This switched to a significant contango market. This was associated with a shortfall in demand without any changes in US and OPEC production. 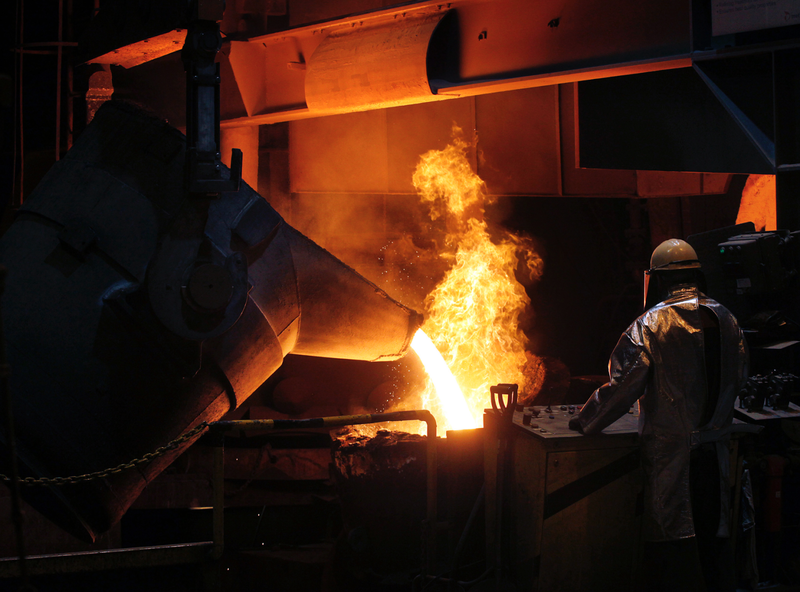 The demand shortfall led to a inventory build which can only be cleared through lowering prices. This will increase refinery and end user demand, but can only be fully adjusted if there is an increase in demand that is greater than the shortfall. The demand increase has to work off the inventory build. The curve gets less steep further out in time because that is the time necessary to work-off the inventory build. In the futures expectations market, the high production will not completely offset by demand even in the long-run which is why longer-dated futures have fallen. We are not trying to explain all of the action in the oil market other than to say that supply and demand shocks will lead to inventory changes that will be reduced through the price adjustment process. This will cause a more immediate reaction in the short-run because of inventory constraints. In the longer-run, inventory adjustments will not play as significant a role. 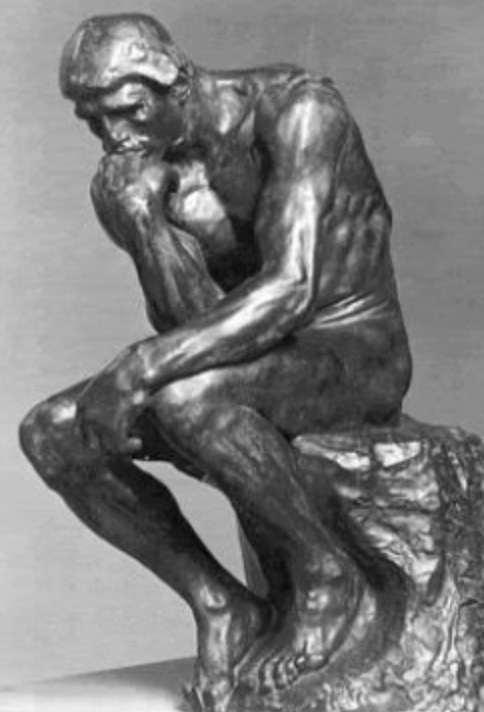 Are you an investor who is "cognitively challenged"? We can use the phrase "cognitively challenged" as a polite way of saying that investors and traders have significant behavioral biases. Investors are "special" when it comes to making decisions. Investor are not any more special than decision-makers in general, but investors are suppose to follow rational behavior. In reality, they do not follow the well-defined ideal rules of expected utility maximization. The investment world has harped on the issues of decision biases making many investors feel challenged, but there has been little to help explain whether these biases truly have any rational basis. It is unfortunate that decision theory has focused on the negative deviations from rationality. It makes us all sound as though we are damaged thinkers when faced with decisions. This actually may not be the case. There is hope for us decision-makers if we describe our behavior in a more nuanced manner. We choose certain behavior because it may be a good alternative to the ideal expected utility maximization model. Think of what it takes to undertake a expected utility maximization. You need to know all of the states of the world and you need to the know the likelihood of them actually occurring. You multiple the state times the probability to get an expected return. You also have to know yourself and the level of risk aversion you have at any point. All of this is doable and makes sense in a perfect world, but we do not live in a world that is anything close to being perfect; consequently, we have to make compromises. Is this irrational? The concept of fast and slow thinking as presented by Daniel Kahneman is not about flawed thinking but about how we think giving different types of problems and information. The one-size fits all behavior of expected utility maximization makes an investor cognitively challenged because it may be overkill in certain situations. The cognitive challenge is learning to apply the right methodology for the problem faced. There is no denying the fact that there are behavior biases with investors but some of the heuristics used by investor to deal with fast problems and uncertainty is good cognitive decision-making. The BIS came out with their Quarterly Review swinging with some provocative statements about the current wisdom in macroeconomics. 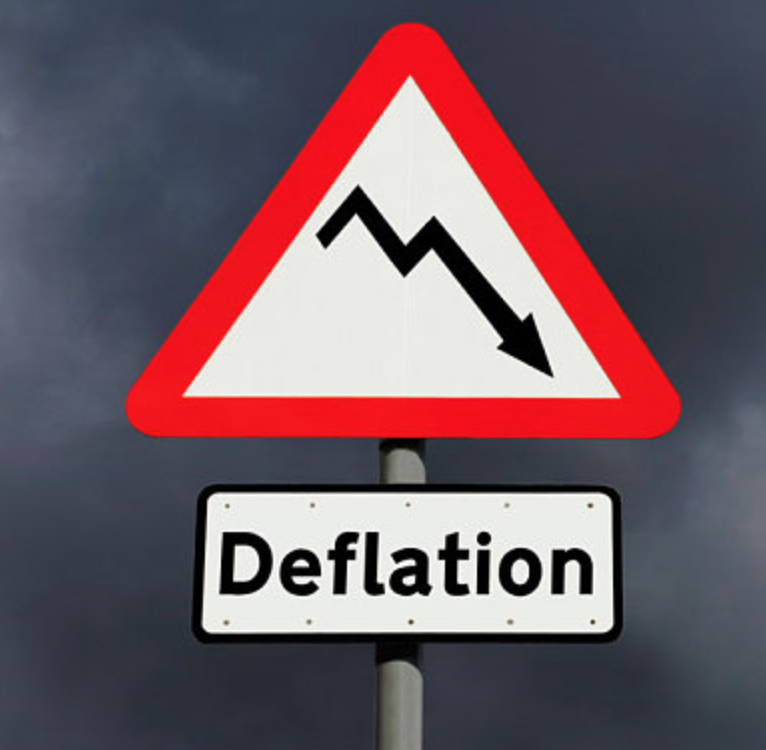 There has been a clear focus on the key link between deflation and economic growth. This perceived link currently seems to drive markets as many believe that deflation is both a signal and a cause of the global economic slowdowns. This deflation growth link seems to be a extension of the old Phillips Curve trade-off discussion between inflation and economic growth. The old (pre-rational expectations view) was that higher inflation was caused or a clear signal of higher economic growth given economic utilization was above the natural rate. Slowing growth would cause a slowdown in inflation. There was a trade-off. The problem with that view was the 70's period of stagflation. Now 40 years later, there is the view that falling inflation retards growth and signals that there is slack in the economy. Of course, this is a simplification, but it provides a framework that is used by many investors. Clearly, low inflation or deflation affects the ability of central banks to control real rates especially when rates are low. Nominal rates can be take to zero but have a hard time going lower. We are finding out this is not the case; however, there is a more complex story. The evidence suggests that the deflation is not the driver of slow growth. The key is not in deflation of prices but deflation in property and assets, but even here the story is not so simple. The financial cycle of boom and bust drives the growth story not overall prices. The solutions are complex. Controlling financial growth will stop the bust, but requires strong policy choices to mitigate cycles. The oil market disconnect - can it continue?